My mother raised four children in a single parent home and to my knowledge, never asked for help. She raised our food, canned and froze everything for the winter, baked bread (you can imagine 4 children when they were given the “treat” of Wonder Bread) of course now realize what a “treat” we were having every day with her homemade bread, tapped 4 maples and boiled the sap on the stove, she made stuffed toys, clothes and she could cut anything that needed to be cut with a big meat saw. I didn’t mention that she was a full time secretary in a department store at this time. We lived in a small town in southern Vermont and for 13 years of my life, we lived in a house on my grandparents’ farm. Being from a small town and living on the farm was a definite help to both my mother and us but again at the time we probably weren’t convinced of it. With saying all this, the outcome was 4 adults growing up and realizing that we had to take care of ourselves and we weren’t to run for help every time things got rough, though I think sometimes she went too far with the lesson. All my siblings and me are always ready to help but go to great lengths not to ask for help. This brings me to this summer when Gary and I went on a 7000 mile trip to Montana to pick up 2 of our grandchildren and bring them to Vermont. On our 10 day trip from Montana, we went to Iowa (car auction with Vin Cassidy), visited every place President Lincoln lived except Washington, to Mammoth Caves in Kentucky and to the largest insane asylum in the world (late 19th century). Arriving home, we picked up our other 2 grandchildren in Waterbury and headed for camp. In all we entertained the children for about 2 weeks when their parents came for 10 days and then took them home. Have to admit mixed with sadness of seeing them go was a bit of glad-ness at seeing them go! Gary and I agree we have never been so tired in our lives (that we can remember). It wasn’t that hard raising our 2 boys! Guess I forget that we were about 40 years younger! Now “the rest of the story” and the point of my rambling. Last month I received an email from Gary Fiske telling me that it was my turn to write for Wheel Tracks (thank you for reminding me, Gary, I would never remember on my own) also saying that if I wasn’t up to it that maybe Mary Noble would trade months. Though it went against the grain to ask, I did. Mary graciously agreed to write the arti-cle in my place and did a fine job of it! She helped me out, for which I will forever be grateful, while entertaining her grandchildren, gardening (on a scale that would put the Green Giant to shame) and raising pigs. Lesson: Always go to a busy person if you need help. I have to tell you it really didn’t hurt at all asking for help but please, don’t turn and run when you see me coming because I’m probably not looking for help. 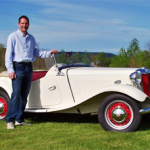 Postscript: I wrote my article before the Stowe Car Show and want to tell you about a couple of things that happened there. The first was Sunday morning about 7 AM when I pulled into the entrance for “Antique Cars only” and two gentlemen came to my window to ask what I was up to. I explained that I needed to drop off our young friend, Ryan and meet up with Gary for a few words and I assured them I would come out this entrance to prove I wasn’t sneaking in. They looked a bit skeptical but helped me out by letting me in (I did go out that way and thanked them). Next, I had another favor to ask (imagine needing ‘help’ twice in less than an hour!) well, Lloyd Harvey stepped up to the plate and helped me out. Thank you Lloyd (and Steve for looking at Lloyd ‘like help the woman’) I think I see a pattern forming so if you see me coming – maybe you should RUN! Author Nancy OlneyPosted on September 2014 Categories The Softer SideLeave a comment on Ask for Help? A lot of our antique cars have, or had a grease fitting or a grease cup on the water pump. Without the proper grease, the water pump bearings will quickly fail. In some cars, particularly Model A Fords, the grease may pass through the water pump in to the cooling system. Ford specified a special water soluble grease. Using a conventional grease can cause a blockage in the radiator. Chrysler specified a special grease for use on their water pumps too. So, what makes water pump grease different than conventional chassis grease? Depending on the grease, it is either a grease that won’t be washed away by water, or a water soluble grease that will wash away and dissolve in water preventing a blockage in the cooling system. 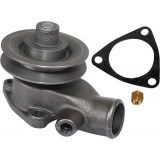 Many replacement or rebuilt water pumps have modern, sealed bearings. Most of these pumps use the original casting and either have a grease fitting, or grease cup, or a spot for the grease fitting to be fitted. Many concourse restoration pumps actually have dummy grease fittings or grease cups to “look the part” of the factory pump. The question is, what grease to use? If you need a water soluble grease, such as for a Model A, most Model A parts- houses stock the water soluble water pump grease. There are several options for non water soluble grease. Most auto parts stores stopped stocking water pump grease decades ago. The most popular modern replacement is marine grease, or the wheel bearing grease for boat trailers. Many people use Lubriplate 115 for water pump grease. Marine shops carry outboard motor grease. Another option is your local fire department. The pumps in fire trucks requires a special, water pump grease. This grease is sitting right on the shelf at the fire house. If you are lucky, they may give you a few pumps from their grease gun, or several ounces from the tub they are using.